BSM Media has been studying GenZers since the day they were born. As the leading expert on Moms, we know that nothing influences the evolution of a generation more than their mothers. There are many behaviors of Generation Z directly linked to the way they were parented, from their level of confidence to their appreciation for vintage brands. While today’s GenZers are growing up, we are engaging with their Moms through blog reviews, research and ambassador groups and we often include their children in these opportunities. 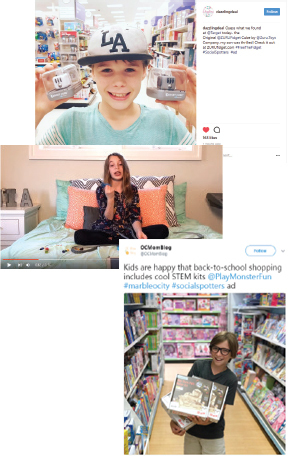 It was a natural progression for BSM Media to apply our expertise in Influencer Engagement of Moms to the GenZ Influencer. CEO of BSM Media, founder of GenZInfluencers.com and author, Maria Bailey is a trendsetter and thought leader in influencer marketing. Ad Age, The Wall Street Journal, CNN, The New York Times, Billboard magazine and hundreds of other media outlets have recognized Maria’s expertise in both the Mom and GenZ Influencer markets. She is the creator of high-profile social media influencer programs including: Disney Social Media Moms Celebration, Beaches Resorts Social Media On The Sand, Purex Insiders, Chick-fil-A Mom’s Panel, HP Smart Moms and Huggies MomInspired programs. Maria is an invited speaker around the globe and her eight marketing books on Mom Marketing and Influencer engagement are published in 12 languages. Maria is also host of Mom Talk Radio, the only nationally syndicated radio show for Moms and the most-downloaded parenting podcast on iTunes. Online, Maria is also the founder of MomTV.com, MomSelect.com, and BlueSuitMom.com.